Nonspecialists with no prior knowledge of physics and only reasonable proficiency with algebra can now understand Einstein's special theory of relativity. Effectively diagrammed and with an emphasis on logical structure, Leo Sartori's rigorous but simple presentation will guide interested readers through concepts of relative time and relative space. 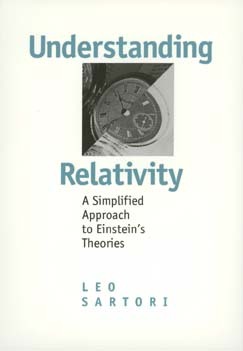 Sartori covers general relativity and cosmology, but focuses on Einstein's theory. He tracks its history and implications. He explores illuminating paradoxes, including the famous twin paradox, the "pole-in-the-barn" paradox, and the Loedel diagram, which is an accessible, graphic approach to relativity. Students of the history and philosophy of science will welcome this concise introduction to the central concept of modern physics. Leo Sartori is Professor of Physics at the University of Nebraska-Lincoln.